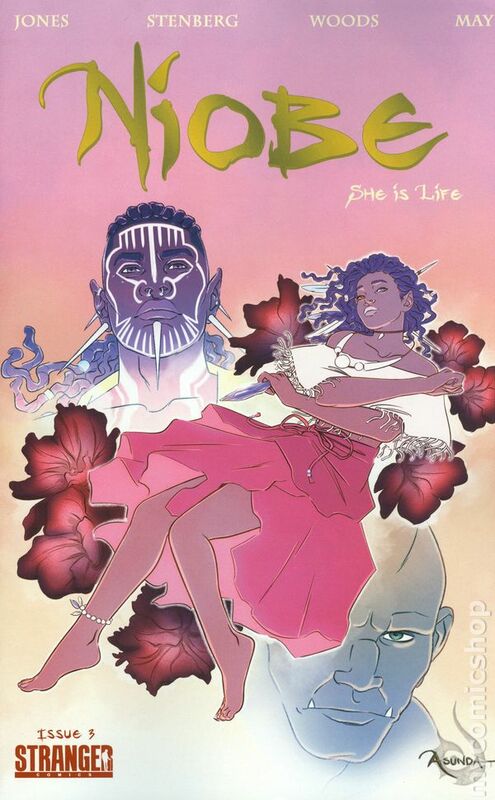 At Denver Comic Con I ran into a large booth for Stranger Comics that was dominated with art for a comic series called Niobe: She is Life. The art for Niobe is striking with many excellent covers of the character Niobe staring out in a variety of different styles. My young daughter quickly became entranced by a children's book there and I stopped and began chatting with Sebastian Jones one of the writers of the Niobe series. I heard of Niobe before but he filled me in on a few things I did know. Many people know of Niobe for having a main character that is both a person of color and female. Many people also know of it because the creative team includes the Actress Amandla Stenberg. There is a lot more to Niobe and her world of Asunda than that though. The world of Niobe was initially laid out in a 12 issue series called the Untamed. This series by Jones himself sets up a world of fantasy with an African influence. The world created is not strictly African folklore, but instead takes elements of Tolkien Fantasy such as Elves, Dwarves and Orcs and mixes them with African Folklore to create a unique world called Asunda. The idea of Asunda was to use anthropology to create a world where each of the fantasy races evolved based off their environment. Asunda was created by Stranger Comics founder and president Sebastian A. Jones over a 20 year period. A true labor of love, Asunda is unlike any other fantasy setting in existence. Developed in coordination with Stranger’s art director, anthropologist Darrell May, Asunda features an honest and oftentimes beautifully violent and savage approach to the medieval sword and sorcery genre, one where the world is exactly that... an entire world, filled with a variety of races which have evolved to suit their environment, not a decades old preconception of what elves and dwarves should be or how they should appear. Sebastian then teamed up with actress Amandla Stenberg (Most known for playing Rue in the Hunger Games). Sebastian and Amandla revisited the world he created with the Untamed in a new series called Niobe. Niobe is the central character in the series and her appearance is based off that of Amandla Stenberg (So no the resemblance is not a coincidence). Niobe is set up as the critical character of the world who has the ability of defeating the world's devil himself. She is the coming of age hero who Jones compared to the world's Luke Skywalker. Niobe must learn who she is, train her skills and eventually face the demons that hunt her. I really like Niobe. It the story is different, the main character has depth, the world has mystique and the art is amazing. The first that draws your attention when looking at Niobe is her eyes. She has these big doe eyes that emanate with pain of her history contrasted against a steely determination. The eyes are also multicolored one hazel and one blue, which is an important detail. Niobe is said to be born of a union between the untamed King Andrek VII (Kind of a vampiric king) and a beautiful Galemren (Elf) Queen named Nadami of Ugoma. The union between the two was not mutual and also created a war between the Untamed and the Galemren. King Andrek denies that Niobe is his progeny however and indeed looks almost exactly like her mother except for on glaring detail. Those multicolored eyes are the same as Andreks. For this reason Niobe is hunted from birth. King Andrek her father wants to remove any evidence of his misdeeds and wants her dead. Meanwhile, others wonder what parts of his powers could exist within her, and hope to use her to their own ends. This leads Niobe to live on the run. This is where Niobe: She is Life begins, she is fleeing from horseback vampire soldiers who hope to hunt her down. She follows the advice of a mystical Esufly and falls into water. While nearly drowning she is saved and brought into a special enclave where she is met with great skepticism. She is quickly pulled into a new controversy where another half breed (This one half orc) is accused of murder. Niobe's strength is also its weakness. This stroy drops the reader right in the middle of Niobe escaping. There is little to no exposition, only a conversation with her spiritual guides. There is no time, or word wasted, you are immediately immersed in Asunda. Both Niobe and Asunda are delightfully complicated, and you as the reader have a lot to chew on. There is also a great deal of mystery as to what this world is and it is revealed page by page. The experience of reading Niobe is a bit like reading spiritual works or poetry. It hits you on similar levels, but it also demands that you take the time to figure it out. Even when exposition is provided in Niobe it is given in flowery language full of metaphors. This is not Spider-Man kicking dudes in the face. If Spider-Man is the meat and potatoes of comics then Niobe is kind of like sushi or fine wine. You have to take your time with it, and savor it to extract out all the goodness. I think this will give Niobe a devoted following but it could also turn off some readers. One thing I would suggest is to read the Untamed series as well which further explains the world of Asunda. This gives you as the reader greater context as to the world, factions, and religions that are at play in Niobe. Niobe and her world of Asunda is definitely something I want to continue to delve into. I plan on doing more reviews, adding some character bios and a general Asunda wiki on to the site. I hope you join me on this journey and discover the lands of Asunda for yourself. Toylab is a member of the Amazon Affiliate program so that we can bring great products from Amazon directly to our readers. I have added the Niobe: She is life trade paper back and also added the series The Untamed: A Sinner's Prayer. Here is some of the stand out Niobe Artwork.